What is a Team Risk Calculator? The TRC enables managers to CALCULATE THEIR team'S Knowledge risk and THE ROI FROM Standard Operating Procedures. Understanding risk within your team can be difficult. We have developed a useful tool to help you identify and measure the knowledge risk within your team. This Team Risk Calculator, enables you to identify your strengths and weaknesses. It will calculate the value of your key players, and help you to mitigate the risks associated with your team's activities. 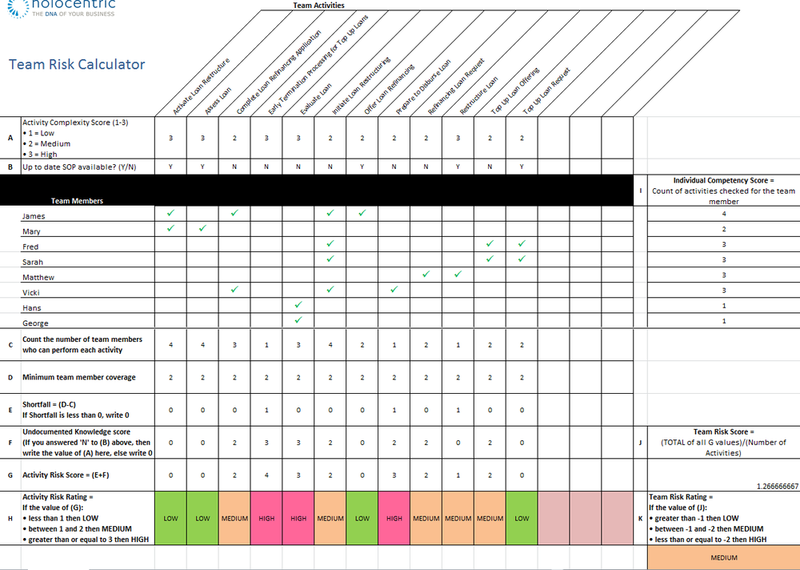 This is an essential tool for all organisations, it highlights where your processes should be documented and whether more team members need to be 'up-skilled' on high risk team activities to minimise impacts when staff move around or depart from the company. The Team Risk Calculator not only automatically generates your Activity Risk Rating and Team Risk Rating, it also populates your team's Standard Operating Procedures (SOPs) ROI Calculator. All you have to do is adjust the global parameters highlighted in yellow to match your organisation's profile. Once these parameters have been completed, the worksheet will automatically calculate the potential annual savings of implementing SOPs, along with the pay back period of the initial investment. Holocentric is currently giving away the TRC and SOPs ROI calculator for free. If you would like your own calculator simply download a copy below.